The task is to determine whether such a formula is satisfiable. While it may ‘scare’ a 1st or 2nd-year student, when you actually break it down and play with an example or two, it turns out to be pretty easy. The ‘scary’ looking aspects are the basic propositional logic truth tables and the BNF grammar for (simplified!) Boolean formulas. Satisfiability of normal Boolean formulas is NP-compete, which you may have memorised, so that looks daunting as well, as if the contestant would have to come up with a nifty optimization to stay within the time limit. As it appears, not so. Instead of being put off by it, let’s look at what is going on. The first line of the BNF grammar says that a formula can be a clause, or a formula followed by a clause that is separated by a disjunction (| ‘or’). The second line says that a clause is a conjunction of literals, which (in the third line) transpires to be just a series of ‘and’ (&) conjunctions between literals. The fourth lines states that a literal can be a variable or its negation, and the fifth line states that a variable is one of the letters in the alphabet. That is, (a)|(~a&b&a&c) is in the language of the grammar, as are the two in the input given, being (a&b&c)|(a&b)|(a) and (x&~x). Do you see a pattern emerging of how the formulas look like with this grammar? It’s a series of disjunctions of conjuncts, and only one of the conjuncts shouldn’t have a contradiction for the formula to be satisfiable. The only way we get a contradiction is if both a literal and its negation are in the same conjunct (analyse the truth tables if you didn’t know that). So, the only thing you have to do with the input is to check whether within the brackets there is, say, an x and a ~x, and with the first conjunct you encounter where there is no contradiction, then the formula is satisfiable and you print YES, else NO. That’s all. So, when given “(a)|(~a&b&a&c)”, you know upon processing the first conjunct “(a)”, that the answer is YES, because “(a)” is trivially not contradictory and thus we can ignore the “(~a&b&a&c)” that does have a contradiction (it doesn’t matter anymore, because we have found one already that doesn’t). I’ll leave the implementation as an exercise to the reader :). From the “10 years of keetblog – reblogging: 2014”: The 2014 post closest to ‘general interest’ is about calculating how much you will be ripped off when collecting team player cards to complete a Panini sticker book collection for some world sports championships, without swapping cards with friends and family. It coincided with the Soccer/football Word Cup in Brazil in 2014. The students of the ICPC Southern Africa Regionals training had some fun with it (and so did I when setting the problem). It may be of interest to students who are now preparing for the IT challenge heats (April 16) or the ICPC world finals (in May; we’ll go again with a UCT team [yay! ], to Thailand this time). Coupon collecting is a very Dutch thing to do, though I never made a serious hobby out of it (nevertheless, I still have a great Brio Koekjesboek thanks to that), but I did collect stamps for a while, which was more interesting than cutting slips off of margarine wrappings. What does any of this have to do with computing, or math, for that matter? A lot. I mean, think of it: how much margarine must we have bought just to have enough slips to order the Brio cookie-baking booklet ‘for free’? Same story for the coffee packet wrappings. Post stamp collecting is harder: you’d want the whole series of a given edition. The Italian company Panini made a business out of it, enticing people to collect all stickers of all team members playing in a world cup. And that’s what got me into this post’s topic. Coaching for the next ACM ICPC, which includes training sessions, made me surf on the web for some interesting problems to solve, so as not to have only previous ICPC regional’s and finals problems to train the students with. Simon Whitehouse has a great blog post on what it would cost to complete the whole Panini sticker book for the 2010 Soccer World Cup in South Africa, without swapping cards with friends, i.e. : how many packets of five stickers would you need to buy to get the whole series of 638 stickers (pictures of soccer players) to put in the sticker book? Answering this question sounded like fun. I reworked a bit the problem description from his post so as to generalize it to finding a way to be able to calculate what it would cost for any world cup—rugby and cricket are important in South Africa, too—and any cost of a packet of stickers (there’s some 6% inflation/year here); read the full problem description (pdf), on the first page. In solving this, first, there are three variables: N for the number of unique stickers, P for the price of a packet of 5 stickers, and C for the total cost we want to know. To calculate C, we thus have , and we’ll round it up to the nearest integer. The crux is how to get to the total number of stickers. The latter is easy to plug into a spreadsheet to obtain the answer. But lo and behold, what’s computed with the math-approach and natural log depends on what you plug in for , i.e., how many decimal digits, and only or the whole of Eq.2. The series with the simple algorithm does not have that problem with the approximations. And you don’t have to do all the math. I didn’t exactly record the time it took to create the spreadsheet versus typing up the simple algorithm, but the latter may even have been faster to do. Besides the observation that the computing way made it simpler to solve the problem with respect to the design, there’s still a remark to be made on computing the total cost. With R10 per packet and the soccer world cup sticker book, you’ll end up paying R8977 to complete the soccer world cup book if you’d do it all by yourself! For many a South African, that’s more than the monthly salary. Completing a 400-sticker world cup for R35/packet is going to cost you R18389 (about €1268 with the current exchange rate). You’d be a lot better off swapping doubles with family and friends rather than buying new packets. Then again, mot people probably won’t calculate how much money they’d be spending on collecting things, so, here’s a basis for a business model for you. Our 2015 Southern Africa ICPC Regionals is nearby, and we have been using some of the 2013 SA problems for training purposes as well as a teaser/taste of what’s to come on the 24th of October (registration closes on Oct 10). While the training materials are on vula (the UCT CMS for courses), some hints to solve some of them may be of general interest. I’ll give a breakdown and a ‘spoiler alert’ for five of the eight problems. The problem-solving aspects and explanations in the training sessions were longer, but these short notes will give you some useful starting points where to look for implementation details already anyway. There’s an island with trees, and the rubber band will enclose them all. That is, we need to find the polygon with corners of the outermost points enclosing the rest of the points. Thus, we need to compute a convex hull. How can that be done, and, more importantly, how can that be done efficiently? Computing the whole solution space is going to take too much time, as there can be between 3 and 15000 points. One technique is the sweepline (generally useful to check out), and one of those tailored to finding the convex hull is the Graham Scan algorithm: first, starting with the left-lowest point, scan the plane of points counter clock-wise to figure out where the points are (points on the same line are ignored), then, second, connect the points in a stepwise fashion from the bottom going counter-clock-wise again: if the angle is >180 (compare values of the coordinates), then discard the penultimate point and connect the 2nd last to the last point. Only 4 teams solved this problem at the 2103 regionals (including the winning team ‘if cats programmed computers’). John cycles A km, Mary runs B km, starting and finishing at the same place using one circular route of M km. This can be computed with a straight-forward modulo operation. All 53 teams solved this problem at the 2013 regionals. Spellchecking in the online search engine; well, given two words, what is the minimum cost of the change operation to go from word_A to word_B, given certain costs of additions, deletions, and character swaps? Comparing strings of characters is around quite a while, from spellchecking, to plagiarism checkers, to DNA sequence alignments, so surely a fine algorithm should be around for that already. Indeed: the minimum edit distance (Levenshtein distance) (nice explanation), where, instead of computing all possible options (very costly! ), you fill in the table accordingly. The ‘tricky’ part is that the basic algorithm for the minimum edit distance counts each change as a cost of 1, whereas in this problem, some changes cost 2; hence, you will have to change those values in the standard algorithm (demo that lets you play with different costs). Only 2 teams solved this problem at the 2103 regionals (including the winning team ‘if cats programmed computers’). Construct a railroad network between cities in the shape of a tree, but put in a bid for the second-most cheapest option. So, we have lines and points, or: some graph algorithm. Two main groups are shortest path (Dijkstra, Bellman-Ford) and spanning tree. We need a minimum spanning tree (MST) to begin with. This reduces the option for the most suitable algorithm to Prim’s or Kruskal’s. Prim requires a particular starting vertex, Kruskal doesn’t. The problem statement doesn’t require a starting vertex, hence Kruskal’s algorithm is the one of choice (example). But then how do we get the second-best spanning tree? Also in this case, many have asked before (thoertically and practically—search online for both): take an edge with weight w that’s not in the MST and results in a cycle when added to the MST, compare w with the weight of the heaviest (non-w) edge in the cycle (v), then of those comparisons among the cycles, take the one with the lowest difference, add the edge with weight w and remove the other edge v. There you have your second-best option. Generate student IDs from the students’ names, following a given pattern. Of itself, this is a somewhat laborious implementation. The only real issue is to keep track of what’s been processed of the string. Here, it is especially useful to first design the solution separately before delving into the murky code, as it otherwise will require a lot of test cases to check the corner cases (and remember you have only one machine). A nice way to design it is to use automata and only then to convert that into code. 39 teams out of the 53 solved this problem at the 2103 regionals. Just in case you’re trying out the remaining problems, and are banging your head against the wall or pulling your hair out: no team solved the Street lights (Problem B; looks like a maths problem, with floating point complication) and the Necklace (Problem G), and only 3 teams solved Matchstick maths (Problem D; ask a team member of ‘if cats programmed computers’, who solved it). 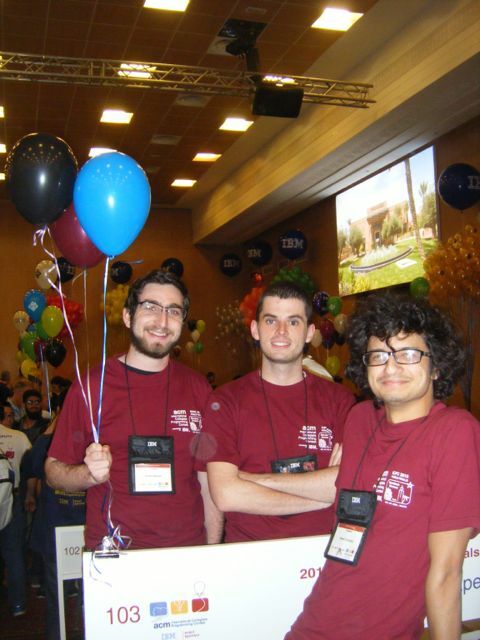 Also this year did we participate in the 39th ACM Intercollegiate Programming Contest World Finals, held in Marrakech, Morocco; the ‘we’ being: the “I Can’t Pronounce Catachtonic” team composed of Yaseen Hamdulay, Robert Spencer, and Sean Wentzel, and me as coach, from the University of Cape Town. We’re the only team from Sub-Saharan Africa, and one of 10 teams in the Africa & Middle East Region, of a total of 128 teams that participated, who were selected from 38160 contestants from 2534 universities of 101 countries on 6 continents that competed in the qualifying regionals. The ‘first to solve a problem’ did so in a mere 5 minutes, from opening the envelope with the problems to having submitted the right code! This was Problem A: Amalgamated Artichokes, and the honour went to Peking University, setting a new record. The UCT team did so in 14 minutes, due to being sidetracked with another first. Then it was like: is this the only ‘easy’ problem, and the rest as grueling as last year’s problem set, and will it come down to ‘the team who solves the second problem will win A&ME’? Soon thereafter, the UCT team solved a second problem—but then so did two other A&ME teams, upping the ante that perhaps the 3rd solved problem would be the decider. UCT was still leading—at some point even on 27th position in the overall scoreboard. I got too nervous, and went for lunch, hoping they would have solved a 3rd one upon returning to the scoreboard. And lo an behold, they had, still leading for A&ME, though overall moving down to the 50s-70s in the dynamic scoreboard. To make matters more exciting for spectators, there were 5 PCs with shared screens and video, so one can see one’s team live on webcam, and see what they are coding, every single keystroke. Nifty, imho; nail-biting for some coaches of medal-contenders. Right before the scoreboard was frozen regarding solved problems (for the last hour of the 5-hour nonstop contest), the American University of Cairo had solved 4 problems, surpassing UCT, but at the cost of a lot of penalty time due to a few wrong submissions, so if the UCT team would solve another problem, and Cairo not, then we’d win A&ME region on time difference. I could see UCT submitted a solution, hoping it was right. Then, sitting in the spectator area, and the Cairo team sitting near that, the scoreboard updated that they had submitted a solution for their 5th problem… and then came the involuntary reaction of its team members, being a mini-cheer. And UCT did not surpass that in the last 30 minutes. Overall, this placed Cairo on 75th place in the final standing, winning the prize for the A&ME region, and UCT just below that, as second in the A&ME region on a very respectable 83, therewith also receiving congrats from other participants, coaches, and interested spectators. So, relatively, they did well, having solved an impressive 4 problems, being A, D, I, and J, and all correct on first submission. This placed UCT ahead of other well-known, and arguably better resourced, universities, such as Uni Illinois at Urbana-Champaign, Virginia Tech, IIIT, Uni Western Australia, Cornell, Moscow Aviation, Calgary, and Rice. That said, at the other end of the spectrum, St. Petersburg ITMO broke the record of having solved all contest problems—a first of all the 39 editions of the ICPC world finals—and first to solve problem G. Moscow State Uni came second (11 problems solved out of 13, with first to solve B and H), Uni of Tokyo came third (also 11 problems solved, with first to solve J and K), and the fourth gold medal went to Tsinghua University (10 problems solved, and first to solve C). If you don’t feel like solving the problems yourself, but still want to know the answer to, among others, cheese slicing, shooting asteroids, tile cutting, and the qanat irrigation system, then have a look at former UCT coach Bruce Merry’s analysis of the problems and directions of the solutions. All in all, it was a good World Finals. An the food was good, the weather good, the other events too (including a fun camel ride), meeting up with coaches and some contestants met last year, the CLI symposium brought some useful information as well, and Steven and Felix Halim generously gave me a hardcopy of their Competitive Programming 3 book. Sean won the ICPC Quest, so a 1st prize was brought back to Cape Town. The planning for participating with a strong UCT team next year has commenced; the 2016 finals will be in Thailand. ‘hard’, where most of the problems have appeared in a World Final. The (direction of the) solutions are on the last page of each pdf, including the UVa Online Judge number, so you can implement and test your solution as well. Localization of the problem description to South Africa: among others, ‘Durban prawns’ (big fat cockroaches are endemic there), ‘nuts for nuts’ (we do have squirrels on campus), ‘shopping for operas’ (Amazon gave up delivering in SA, because so much packets were lost), and some characters got different names. Changed story line: ‘charming canines’ (disagreeable storyline in original), and some now have female characters (cf. mostly male or none). To make the title an alliteration, like the other titles in the problem set: ‘colliding catamarans’ and ‘cult caps’.